This past weekend - April 19-21, 2013 - saw the opening of the Oasis Skateboard Factory (OSF) and Roarockit Skateboard Companies first ever skateboard art auction! The event helped launch Roarockit's new Lil' Rockit builder kit, and raised money for the school by having some of Toronto's finest artists do graphics on 19 hand built boards. In preparation of the show, each student paired up with a different artist and taught them how to build their own board using the Thin Air Press vacuum bag system. After working on the construction, each pair designed an image that incorporated the "Board N' School" theme to apply to the bottom of the deck. Artist's then took their boards home and brought the vision to life! Friday, April 19th - the grand opening party at the Gladstone Hotel's Art Bar. 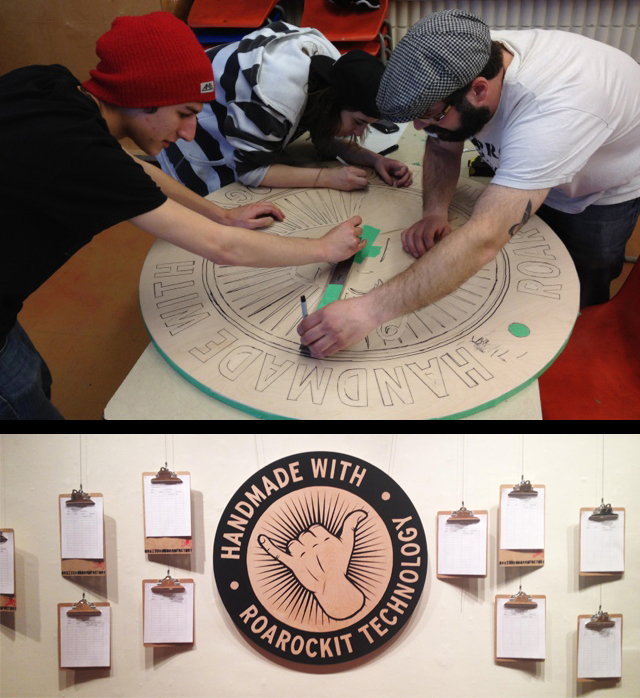 The Roarockit crew arrived early that morning and worked with the OSF students to help set up the show, which included a giant 'Handmade with Roarockit Technology' sign that the kids had made earlier that week in class. Lauren puts the finishing touches on the chalkboard displays. Craig Morrison addresses the troops before the start of the show. The night was filled with great vibes, familiar faces and an overwhelming sense of pride that could be felt from the students as they talked about their innovative program, all whilst keeping a watchful eye on their board's rising bids... they even brought out some of their signature 'Hooky' boards to shred around the gallery! Everyone had a great time at the opening, and almost all of the boards were bid on and won by some very generous and stoked individuals! We would like to thank everyone who came out to support the Oasis program and helped show these students what can be achieved with some hard work and planning. Also, a BIG shout out goes to the Gladstone Hotel, all the artists involved, Lauren and Craig from the OSF...and whoever brought that cake that was chillin in the back! Check out our Facebook page for more photos of the event and the work leading up to it as well.